The origins of Freemasonry in Ireland remain obscure. Documentary evidence for Freemasonry in Ireland dates from 1688 in the form of a manuscript written in Trinity College, Dublin, displaying a knowledge of Freemasonry which can leave no doubt as to the existence, at the time, of working Lodges. The references to Freemasonry in the manuscript are accurate in that they reference: secrecy, benevolence, the term “Lodge” and the prerequisite of being of good character for admittance. The professions of members listed include gentlemen, mechanics, parsons, thatchers, poets, doctors, butchers and tailors. The Grand Lodge of Ancient Free and Accepted Masons of Ireland, the ruling body of the Order, can be traced back to 1725, although it may have existed prior to then. Evidence for this comes from the Dublin Weekly Journal of June that year, where an account is given of the Installation of Richard Parsons, the Earl of Rosse as Grand Master on St. John’s Day. 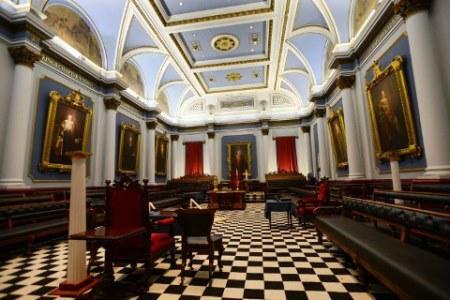 The Irish Grand Lodge is the second oldest in the world, after the English one, which dates from 1717. The function of Grand Lodge, which has always been based in Dublin, was (as it remains today) the regulation of the Lodges, as per the Laws and Constitutions. 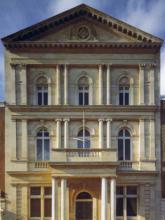 Freemason’s Hall, 17 Molesworth Street, Dublin 2, Ireland is the home of the Grand Lodge of Ireland. It dates from 1866 and was custom built. Prior to this date, Grand Lodge met in Tailors’ Hall in the Back Lane, off High Street, rented accommodation in Dawson Street (the Royal Irish Academy building), D’ Olier Street (No. 16, a tavern, and known as The Freemasons’ Coffee-House), Dame Street (Commercial Building). A Lodge’s permission to meet, from a given date, in a specific location, stems from its Warrant, which is issued to it by the Grand Lodge. However, the Grand Lodge of Ireland was the first in the world to produce Travelling Warrants. Travelling Warrants were issued to Army Regiments (from the 1730’s) and enabling the Brethren to meet Masonically wherever they happened to be stationed. This differed from ordinary Warrants, which confined the Lodge members to a specific meeting location. Travelling Warrants helped to spread the Craft globally, and, therefore, although the vast majority of membership naturally has always been based in Ireland, there are also Irish Lodges established in other countries, such as Australia, England, Nigeria and South Africa.